Here at Hocon Gas, nothing is more important than keeping you and your family safe – and although propane is one of the safest sources of home energy around, it does require some basic care and knowledge about it to keep your family protected. Know how to turn off the propane supply both at the main tank and at each propane appliance. If you’re not sure how to do that, contact us. Teach everyone in your family that a rotten egg smell could mean that you have a dangerous propane leak – and show them what to do if they smell one. NEVER store or place a propane cylinder in an enclosed area such as a basement, garage, or shed. 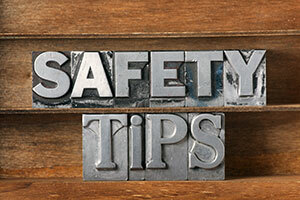 Always store propane cylinders outdoors, and always in an upright position. Install carbon monoxide (CO) detectors at every level in your home, paying particular attention to sleeping areas. Maintain them according to manufacturer’s instructions. We also highly recommend installing propane gas detectors, which can be purchased at your local hardware store. Teach your family how to turn off electricity, propane, and water in your house, and create an emergency preparedness plan that everyone can follow. For tips on making an emergency plan, visit www.ready.gov/make-a-plan. If severe weather is predicted, make sure you have enough propane to last for at least a week after the storm ends in case roads are impassable. If you own a propane backup generator, get it serviced at least once a year. If you suspect any of your propane equipment has been damaged by severe weather, contact us immediately to perform a complete inspection of your propane system. And remember: if you have to turn off your propane gas supply for any reason, Connecticut law requires you to have it turned back on by a professional! Stay safe this spring – contact the pros at Hocon to schedule maintenance for your propane equipment, or if you have any other propane safety questions!